List of our classes and class description. Ultimate Defense Zombies are back! 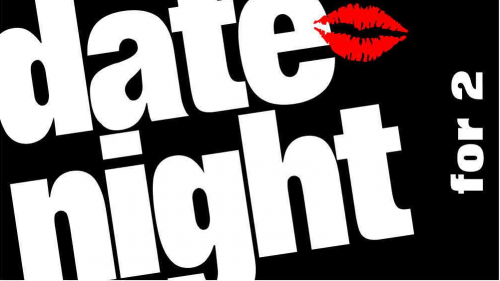 Save the date, September 28th or 29th. Enrollment pens on Thursday September 7th at 12:00 pm. The Associate membership is FREE based on a straight hourly rate. This allows the casual or first time shooter to utilize the range without having to purchase a membership to the range. After completing safety protocols, the client can use the range for a fixed fee of $20 an hour for the first hour and $10 for each additional half hour. 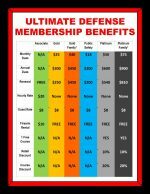 The Public Safety Membership has exactly the same benefits as a Gold Level Membership but at a reduced rate and exclusively applies to law enforcement, fire-fighters, paramedics and active duty military personnel. The annual fee is $200. Monthly payment options are available, but Family Memberships are not. 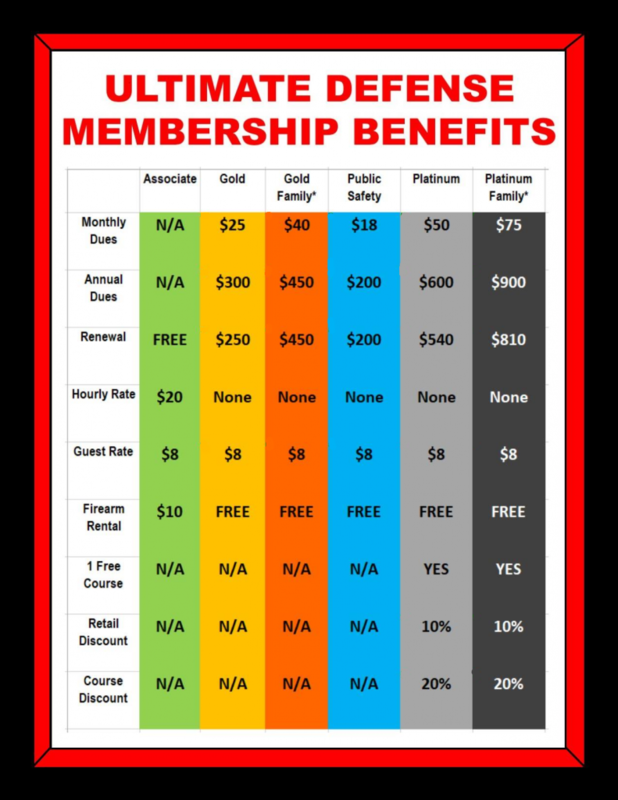 The Platinum Membership is an exclusive level designed for clients seeking to fully utilize all that Ultimate Defense has to offer. The annual fee is $600. As a Platinum client, you will have unlimited use of the firing lanes without hourly range fees during normal business hours, firearms rentals are free, and Platinum members get priority if firing lanes are full. Additionally, a Platinum member receives one free training course annually, a 20% discount on each additional class and receives free transfers on firearms coming into Ultimate Defense. A monthly payment option is available as well as a Family Membership*. NOTE: Ultimate Defense is a Public facility. 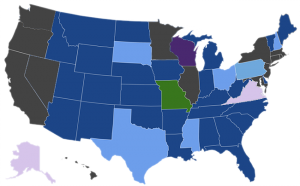 You do NOT need to be a member to use our facility or services. * Family Memberships include spouse and up to two additional memberships for immediate family living in one household. you can rent one and purchase ammo. Bring you own eye and ear protection. If you do not have any, you may use ours.